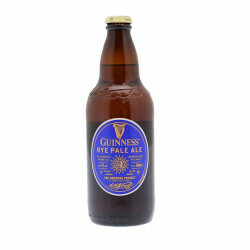 Rye Pale Ale offers a rustic peppery taste balanced with grapefruit notes. The Guinness Rye Pale was originally brewed as a holiday gift for colleagues, friends and families but its success was so popular, it had to be shared with everyone! The rustic, spicy character of rye grain is balanced with citrus and grapefruit from the Mosaic and Cascade hops, making it a fine addition to the Guinness family. Nose: grapefruit and peach with hints of peppery spice. Palate: citrus fruit notes balanced with pepper and malt. Finish: quite dry but refreshing.